Summer has slumped under the weight of one too many humid August afternoons. The garden lies tattered and yellow, completely spent, yielding its reign to the lumpy carpet of crab grass that has chased even the sturdiest of farm wives back into their kitchens, safe from the onslaught of weeds. I often read my prose aloud. I’m content only when the sound of it flows like poetry–when it has rhythm and movement–and is fluid like a song. For I love the kind of writing that swirls around the mind, sweeping through places that newsbites, tweets and status updates rarely find. In the Summer I live outdoors. Studying and writing amidst a tiny, woodland paradise. 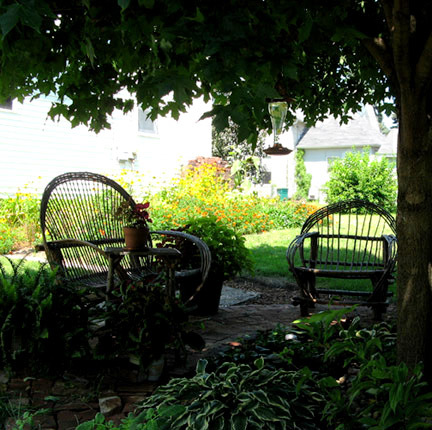 There in a bent willow chair, cooled and refreshed by the shade of a Maple tree, I capture ideas and insights through pen or keys. I admit, all too often, I find myself drinking in the beauty of nature around me. Flowers flow in rivers around my home. Splashes of bright purple, red, yellow and orange give way to soft, glimmering pools of peach, lavender, coral and white–all spilling out across the yard, down to its farthest reaches. It’s a beautiful place. I’m drawn outside every morning with a hot cup of coffee, my Bible, a journal (or two) and, on most days, my neat little Netbook. What a perfectly lovely office! Marked out by a simple patch of bricks, each one lovingly laid in place by the hands of the man I adore. Yet it is not confined to the perimeter of this little patio. It is truly a room with a view. I enjoy birds, rocks, flowers and…green. Green, flowing as far as my eyes can see. Therefore I am not confined, for I often venture into a Kingdom which lies curiously within, yet wonderfully beyond, this refuge outside my backdoor. And there, I read, reflect, write …and sometimes–when I must–weed. But I haven’t blogged. You have noticed that, I’m sure. For there is evidence that you or others of your kind have been here. I’m sure you’ve paused a moment and wondered: Where is she? Has she abandoned her blog? Or someone may have visited for the first time, clicking on the “meet mari” page and then thinking, hmmm, is there a “where’s mari” page, too? Well here I am. Fall has littered it’s first lovely leaves over the bricks of my solace in the shade. Now I’m beginning more and more of my days inside, still with my hot cup of coffee–yet back in my worn-out wingback chair. Ah yes, here I am. Very nice writing. I love the photo of your outdoor “office”! Welcome back. I’ve been waiting…as have others, I’m sure. Thank you for the glimpse of your little piece of paradise and the refreshing description as well. Mari, this reminds me of a quote: “The fundamental delusion of humanity is to suppose that I am here and you are out there” – Yasutani Roshi. It reminds me, just like your description of an outdoor sanctuary that goes forever just like you do, that often times we forget that everything outside of us… the beauty, the love, the compassion… along with the suffering, violence, and pain are all within us. We are all the same as humans, we belong to this vast creation and can’t separate ourselves from it. Thanks for reminding me of that. I forget sometimes because it is so easy to see me as separate from everything else… I think, “I would never act like that person, how rude!” …then I remember a time when I did. Or I see someone being compassionate and loving and I think, “wow, I wish I had it in me to be like that.” …and then I remember, I do. I love you. Thanks!